Lyric Theatre is premiering When We’re Gone, a fascinating new rock musical by two up and coming writers. They are Scotty Arnold who writes the music and Alana Jacoby who created the book and lyrics. They combined three interesting elements: Punk, Pop and Plague. 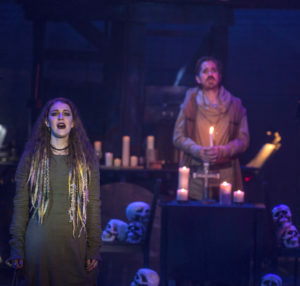 Essentially this is a punk-pop musical set in 1349 during the horrendous scourge we know as the Black Plague. The music is a surprisingly good fit for the emotional as well as the physical obstacles medieval citizens encounter. 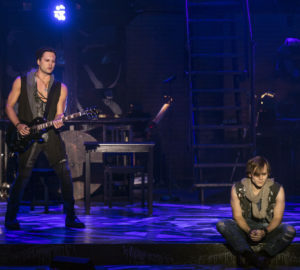 The story centers around one member of a rock band, Todd, who is trying to come to terms with the death and destruction surrounding him as well as figuring out his place. He must choose his path, and he has four choices. Those choices are piety, as represented by his father, love as represented as the beautiful girl he is smitten with, service with a former band member, the drummer who has become a doctor, or art, represented by the lead singer of the band. 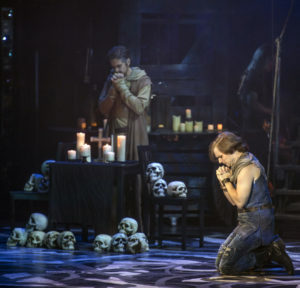 The play begins with the appearance of the original founder of their band John, who is deceased, and he represents death. He is the guide and initially functions in a narrative capacity. Before his death, he was the lead singer of the band, and the band would play in a tavern run by the beautiful wench Rosie. The two were lovers. After his death, Ashton becomes the lead singer and Todd, our hero falls in love with Rosie. Ashton represents art and Rosie represents love. The bands drummer is Colin, and he has left the band becoming a doctor for plague victims. He represents service. Todd is also being pressured by his father, William, who wants him to find solace and salvation in God. He represents piety. Kat Metcalfe (Rosie) and Matthew Alvin Brown (William) in Lyric’s When We’re Gone. Photo by KO Rinearson. The success of a musical is dependent upon three important aspects not unlike the legs of a stool that support the weight of the production. The three legs represent what is seen, what is heard and what is felt. It is important for a production to move freely so two of the legs are unattached, but it is also important for the production to have stability so one leg of the stool is firmly attached to the floor to provide the foundational support. It is up to the director to decide which leg of the stool to be part of the foundation, and which legs are more fluid. Some directors do not make the decision, and all three legs are only attached to the seat, but seasoned directors make a choice. Superb directors make the right choice; and that choice is what is felt. What is seen is vital, what is heard is important but what is felt is what is communicated to the audience. That is the choice that Michael Baron makes in directing When We’re Gone. As a result the audience is able to connect with the vital part of the story, and the connection is dynamic. John is played by Van Hughes with skill and a serenity that only someone who has found grace in the afterlife can display. Todd is brilliantly played by John Furey. Furey’s voice is filled with emotion and he wears his heart on his sleeve. As he sings his heart also grieves. William is expressively played by Matthew Alvin Brown, a talent familiar to Lyric audiences. Kat Metcalfe is Rosie, and she compels not just the love and attention of Todd. She enraptures the entire audience as well. Derrick Medrano is lead singer Ashton, and his angst and drive is palpable. Antonio Rodriguez is Colin, who has a singular mission and is trying his best in an impossible situation. There are a lot of good musicals out there, but not all of them have genuinely good music. Music you can sing to, play on repeat in your car, keep on shuffle in your phone, and belt in the shower. Music you can live with. This show is the exception to that. It’s a play, sure, but what it’s made of is rock music, good rock music, that withstands whatever is thrown at it. If the people who faced the plague and its ravages in the 14th century actually had rock music to get them through it, who knows how they might have fared. Matthew Alvin Brown (William), left and John Furey (Todd). Photo by KO Rinearson. Two years ago, Baron and Associate Artistic Director Ashley Wells first saw an early version of When We’re Gone in New York City. They immediately knew it was the right show for The Lyric, and began work on bringing this new show to Oklahoma City. The Lyric has created what Arnold calls a “dream production” of the show, making it the best version it can be. The technical aspects of the show contribute to that dreamlike quality. Lighting design by Helena Kuukka is brilliant, ethereal and visually stunning. Scenic design by Adam Koch is deliberate and reminiscent of London. Costume design by Jeffrey Meek is always unique and elaborate, and the costumes in this show blend pop-punk themes with the medieval setting perfectly. The truth of a rock-star is struggle, and the experience of a musician is travel, which is often accompanied by loneliness and a nomadic lifestyle. Todd must face all of these, and even though it’s 1349, it’s a modern platitude. The struggles themselves may be different than today, but the experience is the same. Blending universal truths with specific themes of rock music, set against a backdrop of a plague that wiped out a third of the world’s population, doesn’t sound like it would work. But it does. The story is complicated, takes itself seriously, but is still fun and rocks harder than anyone would expect from musical theatre. When We’re Gone doesn’t fit a mold. It effectively creates its own rules and makes its own way in the rock theatre genre. Lyric Theatre of Oklahoma is ambitious and gracious in their contribution and support of new works. When We’re Gone is new, a world premiere that is nearly perfect and it’s a work, no a ROCK of Art. When We’re Gone runs through October 14th at Lyric Theatre of OKC, in their Lyric at the Plaza Location. Lyric is located at 1727 NW 16th St, OKC OK. For tickets visit lyrictheatreokc.com or call the box office at 405-524-9312. The cast of When We’re Gone. Photo by KO Rinearson. A new work is usually not flawless; this one is inspirational; if flaws are found, they are, like beauty marks, an enhancement of the work as a whole. Arnold and Jacoby should be very proud of their musical as well as grateful to Michael Baron and the Lyric for presenting the work with perfect artistic integrity. Any future tweaks they might make may improve the script, but this premiere has set the standard for all future productions to meet. Absolutely! and what a premiere it is!! it sets the bar high.